Four years ago, the Lyons distillery promised barrels of straight-malt whiskey to prospective investors. Now, the long wait is over. Funding a dream as big as opening a distillery in a spirited state like Colorado isn’t easy—or cheap. For that reason, the team behind Lyons-based Spirit Hound Distillers got crafty when securing the final funding needed to make that dream a reality. Taking a page from the wine industry, Spirit Hound launched a successful “Whiskey Futures Program” just before opening to the public in 2012. 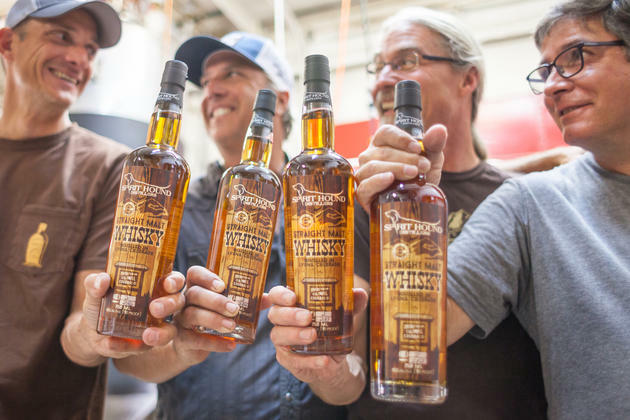 In exchange for up-front funding, the five co-owners offered claims to 50 different barrels of the distillery’s inaugural batches of straight-malt whiskey. The catch? The investors would have to wait to receive their booze until the spirit reached its peak in the aging process. Just this month, that whiskey finally hit the two-year mark and is now ready to be distributed. In the end, five liquor stores participated in Spirit Hound’s “Whiskey Futures Program.” Spirit Hound’s crafted whiskey has since been maturing in barrels for two years—the standard amount of aging time for straight whiskey. On July 11, Anderson and his team delivered several cases to three of those supportive liquor stores: Argonaut Wine & Liquor, Superior Liquor, and Boulder Liquor Mart. Each store’s shipment was unique to the specific barrel it laid claim to with financial support four years ago. “For us, it was mostly about Colorado businesses, and some good people, and supporting Colorado brands,” says Ron Vaughn, co-owner and CEO of Argonaut. “Last week, we went up to Lyons to taste our barrel of whiskey, and it had such great flavor.” The finished product is cask strength, meaning that it is undiluted with water and bottled at an ABV of around 62 percent. The resulting whiskey may be strong, but it's also smooth, buttery, and filled with subtle caramel notes. If you're ready to sample some of that cask-strength goodness yourself, don’t head to the Spirit Hound distillery in Lyons—you won’t find it. Instead, grab a bottle at Argonaut, Superior Liquor, or Boulder Liquor Mart. Boulder-based Hazel’s Beverage World will receive its limited supply of store-unique bottles in early 2017. As for Wilbur’s Total Beverage of Fort Collins? Well, that outpost plans to let its portion of the spirit continue to barrel age until further notice.